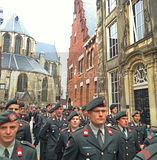 Yesterday 62 new soldiers of my batallion 20 NATRES batallion were sworn in at Alkmaar. The location was in the town of Alkmaar on a square famous by tourists, the cheese market. We had to walk through the streets of the town to reach the square. After reaching the square the troops were placed into position, there were delegations of each of the 6 companies. Guests from other units, relatives and some veterans. Here you see the soldiers waiting to be sworn in. One of the 6 delegations. The meir of Alkmaar was present as well. With all the troops were in position the Standard arrived at the scene. The Standard represents the queen. We are all sworn in with our righthand holding the Standard. We swear the oath to the queen and the laws of our country. Our national hymne the Wilhelmus was played and the cermony began around 11 o'clock in the morning. The ceremony ended at 13 o'clock . With the army band in front of us we marched back to the busses again.